Before digital cameras and Photoshop creative commercial photography was done “mechano-optically”; meaning, we built rigs and sets and optically combined elements either in-camera or in the darkroom. My first commercial job, some 25 years ago, was for Apple Computer. 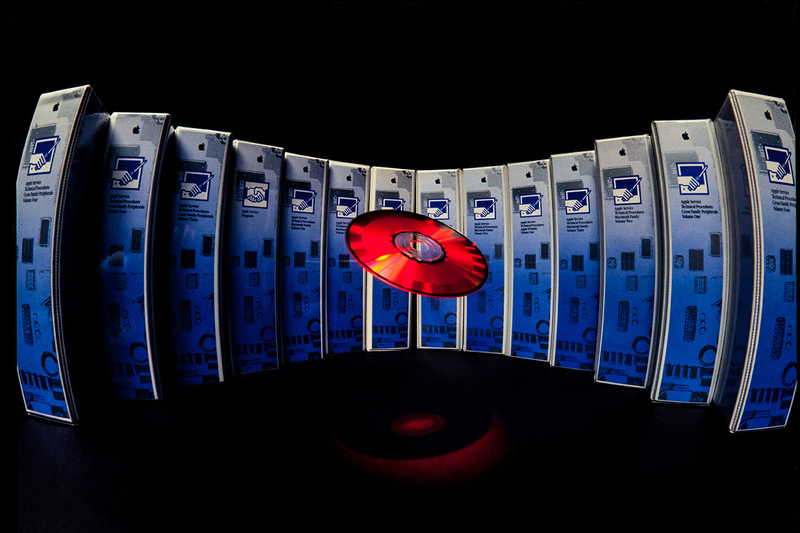 They wanted an image to dramatically illustrate their intent to go paperless. Apple’s Service division was picked as an example for this goal. The reference material for their technicians were dozens of binders that took up a lot of space and were costly to produce. So, putting all this information on CD’s that every technician could have saved money and trees; Win, Win! They gave me a pile of binders and a CD and asked if I had any ideas; Uh…sure, I’d think of something! I’ve been warping reality with my 16mm fisheye since the early 1970’s, so, I thought this would be an ideal use of this lens. I knew that if I kept my center of interest in the center of the composition it would look natural (un-warped) while the closer I placed the camera, anything I put around it would be progressively more warped towards the edges of the frame. So, my vision was of the CD Floating in the front of the warped row of binders that were wrapping around it. The image came out EXACTLY as I imagined it—with the unexpected bonus of the shadow of the CD, outlined in red, on the table; that took extra effort. This is a basic mechano-optical image. The machano part (floating the disk) was the easy part. The disk is supported on a telescoping rod (a mechanic’s magnet) that’s passing between the binders directly behind the disk. The rod is clamped in a vise. The magnet was removed from the rod and velcro was used to attach the disk to the rod. Ta-Da! One floating disk. This was the hard part. I rented a basic studio pack (the Norman P2000D) and heads and their unique Norman Tri-Lite. I knew I was going to need a spot source on the disk and a way to gel that source. The Tri-Lite was ideal because it’s a focusable spot and it has a 3x3” filter drawer builtin; it’s also capable of 1200 watt seconds. Note: That’s when I noticed the faint shadow of the disk on the table and I wanted more of that in addition to more intense color! On Ektachrome EPP, 100 ASA, 35mm film @ 1/30 sec. 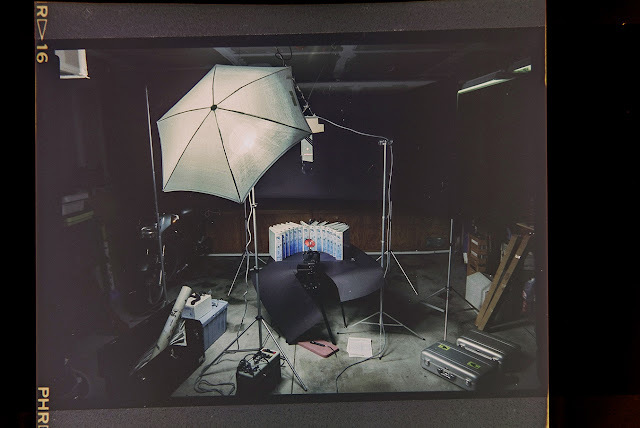 Here’s an image of the set-up in my garage proto-studio; circa 1990. The only other difficulty getting this image was blacking out the background. I had to put up Savage Super Black (107”) paper all around the set because the 16mm fisheye lens’ angle of view is 180 degrees. In case you were wondering how I could remember all this information I actually did a complete story board of this project along with documenting all of the experimenting I did with the color jells and different exposures with results. I had a lot of fun doing this project and was well paid for it too. Unfortunately, the public never saw the results since this image was for Apple’s internal use only. I also enjoyed bring back a little of the way we did things in the past…boy do we have it easy today!